With each season that passes by there is a new opportunity to embrace new and fun trends. Sometimes trends are must-embrace fashion trends, where as others you may choose to ignore. Whether you’re opinionated about coming and going trends is up to you, but it’s always worth to look into what is popular in the fashion world. This season’s trends are all about patterns, color, and polka dots. Whether you choose to enjoy them is entirely up to you, but women’s wear is fiercer than ever. So instead of rolling your eyes at new trends that may not be your favorite, have fun with the trends you do like and enjoy them while you can. You can always continue to wear trends after they fade too – be a trend setter! Colorblock Outfits – If you’re not afraid of a little color and stand – out patterns, color – blocking is taking over spring fashion and is showing up on dresses, cardigans, and more.Usually colorblocked outfits consist of three colors that come together to create a bold and beautiful look. Articles of clothing are continuously being designed with fun and bold patterns that create a color – blocked design. Are you in or are you out? Polka Dots – Sometimes it’s nice to have a pretty pattern on your blouse, and polka dots are no exception. Purchase a few blouses or tee-shirts with a polka dot design and wear it to the office when you want to spice things up a little. 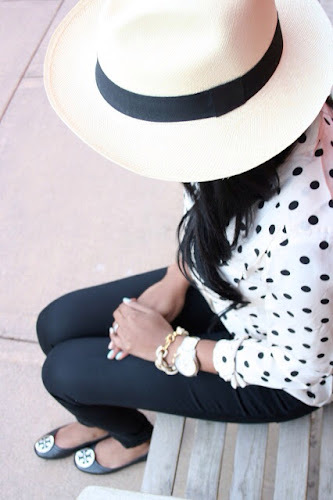 Polka dots are also very playful for spring and look wonderful paired with skinny jeans or leggings! Don’t get cold though! Wear a thermal that’s perfect for layering from www.damart.co.uk over your polka dotted top and look forward to more spring time trends that will emerge. Hot Pink – Bright colors are another bold fashion trend and depending on how bright you prefer your clothes to be, hot pink in particular will definitely bright things up. Since hot pink is already bold as is, make sure the rest of your outfit is in neutral tones. Pair a hot pink tee with black leggings and a long coat, for example. Spring is in full bloom and so are you! Metallics – If sparkle and glitz is something that you adore, then why not embrace this season’s hottest trend of dazzling metallics? Wear a sequin tee, metallic frock, or even a metallic mini. This fun trend will dazzle your friends and brighten up a boring party. Sierra is a writer who enjoys staying up to date on the latest trends. View what she loves about fashion on her blog Ocean Dreams.